Looking back on our history spanning over 110 years, we can see that AGC has repeatedly tackled major challenges in order to provide what the world needs and what our customers expect. Our first challenge was, needless to say, the manufacture of flat glass for architectural use. Over a 30-year period from the Meiji Restoration in 1868, a number of people attempted to manufacture flat glass, but all those efforts failed, and domestic production of flat glass was thereby considered impossible. 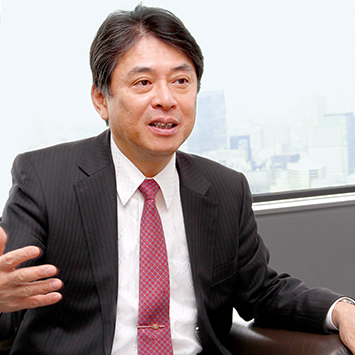 A man who bravely challenged this “common sense” was Toshiya Iwasaki, founder of AGC. 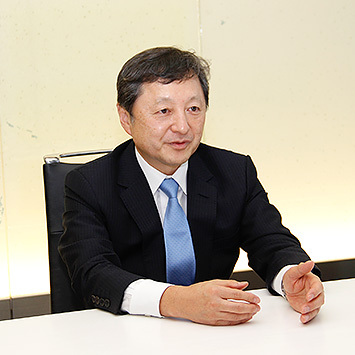 Toshiya, who had studied applied chemistry in London when young, believed that technology was the very source of competitiveness and that learning and applying advanced European and U.S. technologies was indispensable for the development of Japanese industries. Through his intensive efforts with originality and ingenuity, and bearing this firm belief in mind, he succeeded in manufacturing flat glass for the first time in Japan. 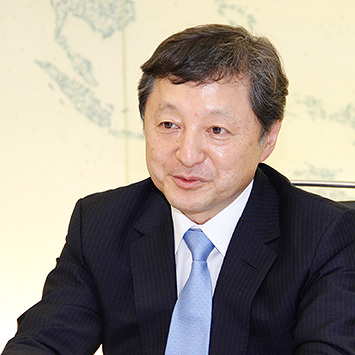 Following this achievement, he also successfully started domestic production of soda ash and heat-resistant bricks which had all previously been imported from outside Japan, to which the AGC Group’s chemical products business and the ceramics business of today are attributable. Although these technologies were initially imported from other countries, they were transformed into AGC’s original technologies in the processes of deepening expertise, and at the same time, manufacturing technology for mass production was accumulated. By repeating these processes, AGC’s original core technologies, not found anywhere else in the world, were developed ranging from glass, electronics, and chemicals to ceramics, based on which I believe our corporate culture of placing the most importance in technological development was fostered. 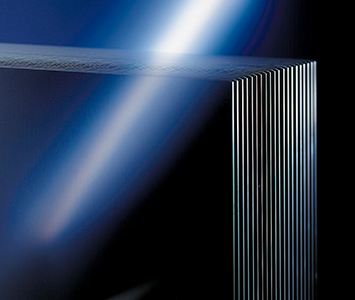 The tube glass (cathode-ray tube) business expanded in line with the spread of televisions. After World War II, our technology bloomed significantly. 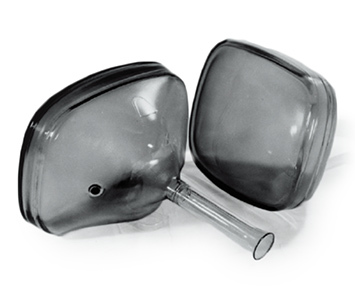 Backed by a favorable wind of motorization, the automotive glass business expanded, and in line with the spread of televisions, the tube glass (cathode-ray tube) business grew. As for the business of chemical products, we developed the electrolytic method triggered by public pollution concerns to replace the traditional mercury process which had been introduced from overseas, and electrolyte membranes for use therein. Furthermore, the fluoroproducts business was established in which chlorine produced by the electrolyte method was used as a raw material. Such business expansion based on our challenge spirit has continued to date. In the past, it was said that the non-alkali glass for liquid crystal televisions could never be produced by the float process. 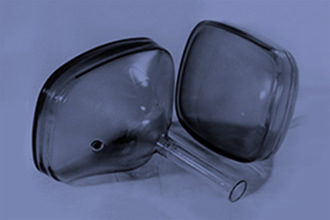 AGC attempted, which may have been called a reckless venture, to develop technologies for non-alkali glass, and finally succeeded in the development of its original float process and polishing techniques over a ten year-period. The product “AN100” which was produced using those technologies has contributed to propel the growth of the company into the world’s 2nd largest manufacturer of glass substrates for TFTs. AGC further expanded into the field of pharmaceutical and agrochemical intermediates and agents by evolving its fluorochemical technology, the core technology of the AGC Group’s chemical products. Our biotechnology, which dates back to 1985 when we started cultivation of yeast, has continued to the present CDMO (Contract Development and Manufacturing Organization) business. 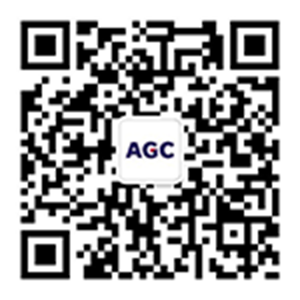 In this way, it is exactly AGC’s strength which originated from the enthusiasm to develop technology, the products generated by applying such technology, and highly advanced production technologies to produce such products. The phrase “Technological development” has two meanings. Product development conducted from a short-term perspective and development of basic technology conducted from a medium- to long-term perspective, and sustainable business growth is realized only when both of them work together. I believe that short-term development is most important to see future (medium- to long-term) technological trends. In other words, the future will come into view when we continue development while extending the short-term point of view little by little along the road map. There are two key strengths in AGC in terms of short-term development. One of them is that we have a variety of technology. Based on our technological platform, we can combine several technologies together to create new functions and value. That’s the major strength of AGC. For example, AGC has developed coating technology since the 1970s from the long-term perspective. Using this technology, we made it possible to not only manufacture raw glass but also improve the functionality of architectural glass and automotive glass by applying various surface treatments to glass. In addition, as I mentioned earlier, we have conducted basic research on biotechnology for over 30 years, which established the foundation of the present life science business. One thing worth mentioning here is that once we set a target for a certain technological domain that will be required in 20 or 30 years, it is important for us, as our corporate culture, to continue the research activities with patience even if profits are not recorded at all. 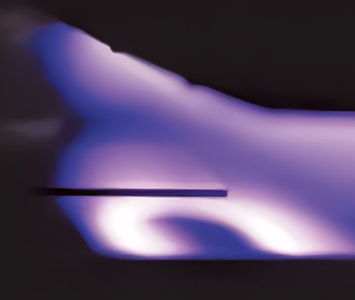 One of the typical cases is found in the development of glass substrates for TFTs. In those days, the research faced a series of difficulties, and there was no guarantee that cathode-ray tube televisions would be replaced by liquid crystal televisions. Despite such a situation, our glass substrates for TFTs became a product which earned huge profits just because AGC continued the research and finally achieved the goal. The speed of change in the 21st century has reduced to less than a half of that in the 20th century. This means that change takes place faster, and it has become more difficult to foresee the future. I have two ideas of how to address this challenge. The first is the integration of existing technologies. For example, a chemical product contains various kinds of raw materials, but one raw material alone is not sufficient for us to set up an actual applied business. We operate many businesses such as architectural glass, automotive glass and electronics. If we combine raw materials for chemical products and the existing businesses together, we will be able to produce components with totally new functions. The second one is open innovation. We engage in various types of open innovation such as cooperation with a university, joint development with a client company, investments in startups and M&A, all of which will accelerate development activities by positively taking in external technologies, expertise, ideas and so on. 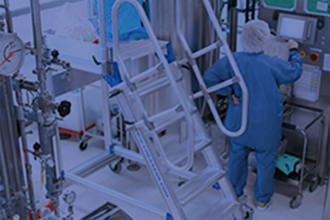 One of our most successful examples is the acquisition of CMC Biologics (CMC) through which AGC not only obtained mammalian cell-culture techniques but could also capture the European and the U.S. markets held by CMC. In addition, joint development with a customer is also a method with a high probability of success, because if the development is successful, that customer will certainly use the developed material. 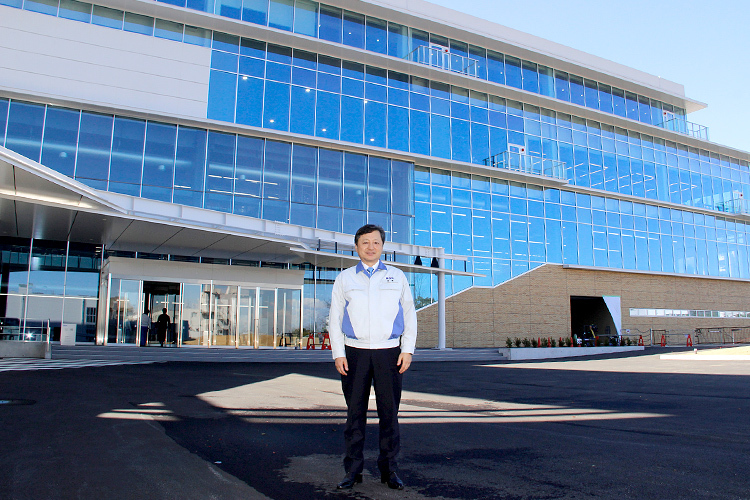 The new R&D building to be constructed within the Keihin Plant under the “Co-create Space Construction Project” also points to the spirit of open innovation. 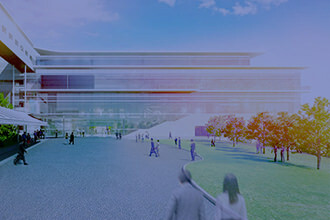 This new R&D base aims at not only “joint creation” with external partners but also promoting internal open innovation. To date, the locations of basic research, product development, process development and facilities development were not centralized, and exchange with each other was not active. Therefore, the purpose of this project is to accelerate the integration and the development speed by connecting them seamlessly and through cooperation and coordination among them from the initial stage of development. This policy of open innovation applies not only to our business in Japan but also to our global business. AGC has already established a branch office in Silicon Valley for development of new businesses, reinforcing the existing technology exploration functions in addition to commercialization efforts by gathering technological information and identifying the needs of startups and customer companies. Furthermore, we shifted the head office of our bio business to Seattle, U.S.A. with the aim of responding to the world’s most advanced businesses. Other than those mentioned above, we plan to establish innovation bases in Europe, Singapore and China in order to build R&D systems globally including Japan. Among those countries, China is now the world leader in terms of the number of patent applications, and is expected to become “a great innovation country” from the past state of so-called “Factory of the World” and “World’s largest consumer.” In line with this trend, we are also determined to globalize our human resources by actively employing talented local staff. Since I assumed the post of CTO, I have placed an emphasis on the significance of open innovation under the slogan “Departure from full in-house production.” Now that three years have passed, I really feel positive responses that the slogan has become a reality. However, I would like to point out that open innovation does not mean to open everything, in reality, it is an “Open and Closed” strategy. The basic concept is that the core technology should be kept undisclosed for protection while allowing part of the technology to be proactively openly disclosed. Our open innovation collects a variety of expertise from outside and creates connections, while keeping core proprietary technologies undisclosed. 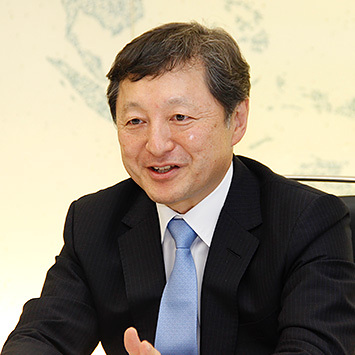 Towards the Group’s long-term growth strategy described in “Vision 2025,” AGC concentrates its efforts in three strategic businesses consisting of mobility, electronics and life science, setting a target composition ratio of operating income from these businesses at 25% in 2020 and over 40% in 2025. While it is a very high target, I believe that we will be able to achieve it because AGC has been striving hard to enhance these business domains for many years. In particular, mobility is the very domain in which major transformation is now taking place as witnessed in the transition from conventional vehicles to electric vehicles and fuel-cell vehicles, and the advancement of technologies including autonomous driving and connectivity. In line with such transformation, glass is no longer a simple material with the function of just separating inside from outside. Instead, it has become indispensable as a component with such functions as display, sensing and telecommunication as it is integrated with electronics and chemical materials. 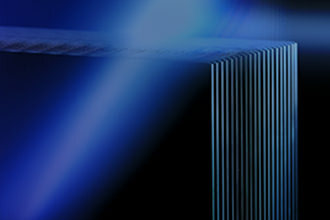 AGC already has the world’s most advanced technologies and products in the fields of glass substrates for high resolution displays, glass for vehicle interiors and integrated glass antenna, and we are convinced that we are capable of contributing to the evolution of automobiles by combining them. By using them in vehicles, I believe that vehicles will become more like a mobile device, and that the age of easy movement and communication using vehicles is just around the corner. Not only vehicles, glass exists in the nearest position from our eyes. For example, when we walk around Ginza, what we see most is glass. It is because glass is part of our daily lives that many people are unaware of this fact. In this manner, glass is like a prime location for doing business, and I expect that we will have more and more opportunities in the future. Following the founder and many of our predecessors, we will continue to produce innovation with the brave spirit of challenging.